Over time PowerPoint has become the de facto application that is used at meetings around the world regardless of which topic or meeting format. However once a PowerPoint presentation is presented at a meeting the meeting turns from bi-directional to a broadcast communication format. PowerPoint is killing discussions and open communication in meetings. Instead we have all turned into Slide zombies that read slides together. How did we get here? Well I'm not taking anything away from Powerpoint and actually I'm just as guilty as everyone else for using it during meetings. PowerPoint is a great and easy to use tool which is also the problem. PowerPoint is making collaboration more difficult as PowerPoint is becoming the new moderator of our meetings. Powerpoint has become a shield between your meeting audience and the person presenting. This shield is blocking creativity and collaboration and we need to break down this barrier. Banning PowerPoint seems to be a growing trend not only in business but also at universities and believe it or not the US Military has banned PowerPoint as well. This trend seems to be gaining momentum as it should. PowerPoint is banned at Copenhagen Business School lectures to return the focus back to the whiteboards. Remember back in class when a professor unraveled sometimes unbelievable knowledge onto a chalkboard (now whiteboards)? These sessions created great debates and interactions from the students. This however required lots of planning and preparation time from professors. These sessions were also dynamic based on the questions and answers coming from the students and professor responses. With PowerPoint we only get bullet points and images from Google which according to this article's research "Makes students more dumb and professors boring"
Steve Jobs banned Powerpoint in his meetings long ago putting the focus back on human interaction. A little more to help with the question "why." Well structured, narrative text is what we're after rather than just text. 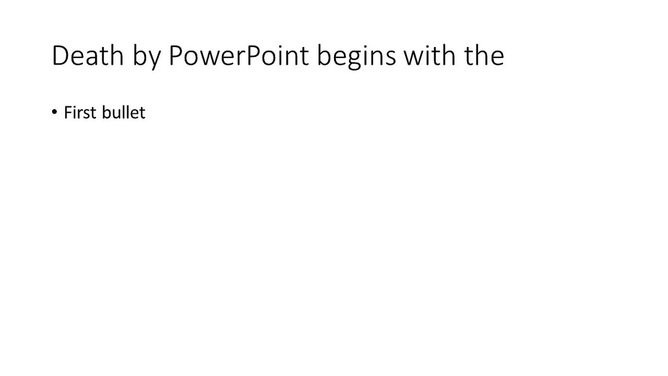 If someone builds a list of bullet points in word, that would be just as bad as powerpoint. The reason writing a good 4 page memo is harder than "writing" a 20 page powerpoint is because the narrative structure of a good memo forces better thought and better understanding of what's more important than what, and how things are related. How can I ban PowerPoint in my Workplace? This is a very difficult question to answer as we are not only changing how we work and collaborate but almost a cultural change that we have to address. From the C-level down this needs to be addressed. 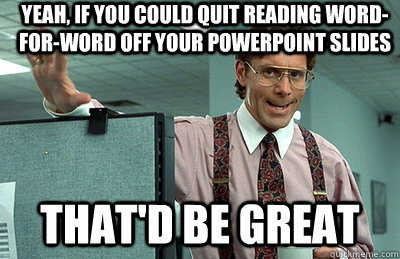 I'm starting the PowerPoint cleanse in our meetings and I hope you do the same. Ban PowerPoint in meetings now!